These fountain pens, envelops and notebook are some of about 3,000 products that customers can order from Goulet Pen Co. LLC, an online retail store for fountain pens, fine papers, inks and other items. Brian Goulet thought he would go into the real estate business after graduating from Virginia Tech in 2006. As the housing crisis closed in, though, he saw an opportunity to turn his pen-making hobby into a career. Now in its sixth year, The Goulet Pen Co. has become a destination for pen fanatics across the world. By infusing a staid luxury market with youthful enthusiasm, the company is showing that handwritten communication remains relevant. Fountain pens in particular may seem like a niche product, but Goulet says they’ve become the backbone of his business. They’re so popular that Goulet no longer turns wooden ballpoint pens on a lathe. Instead, he’s gone full bore on fountain pens, inks and papers, scouting the world for the best. Surprisingly, Goulet has discovered that fountain pens and digital culture go hand in hand. “Online is what we know and do best,” he says. The company’s website, GouletPens.com, features a blog called Ink Nouveau, which includes video reviews of products and a weekly Q&A. Fans flock to the comments section, eager to trade tips and insights. The site is also where Goulet sells a large number of its pens. This kind of consumer education and community is what allows The Goulet Pen Co. to keep an edge over competitors such as Amazon. The company’s meticulous packaging is another widely praised distinction. Customers have filmed themselves opening their boxes, later posting the video to YouTube. “Our focus is on product knowledge, reliable shipping and that personal touch,” says Goulet, who offers on-site pickup but has no plans for a bricks-and-mortar store. Every customer’s invoice bears a handwritten note — an effort supported by Brian’s wife, Rachel, who is co-president. The Goulets also take pride in creating an ad-free e-commerce site. Six media mavens are responsible for maintaining the grass-roots approach, by announcing new arrivals and interacting with online customers. That’s a long way from the days when the Goulets ran their business out of a 100-square-foot guest bedroom. She says Rachel would occasionally go off-screen, heeding the call of a baby monitor. Booker says she buys an array of pens, and uses separate ones for sketching out grocery lists and signing important documents. Ed Showalter, another loyal customer, agrees with Booker that fountain pens are great conversation starters, too. With more than 400 fountain pens and more than 600 bottles of ink to choose from, The Goulet Pen Co. catalog could seem daunting for a novice. A $10 monthly club called Ink Drop provides curious customers with five ink samples. Neophytes can also dive into the Specials section of GouletPens.com, where they’ll find “The Goulet Outlet” — sales and closeouts that have been relegated to “the bottom shelf.” Like many local restaurants, The Goulet Pen Co. likes to keep its offerings seasonal. The website’s front page recently featured a lilac-colored fountain pen, which the company created in collaboration with the popular Edison Pens in Milan, Ohio. 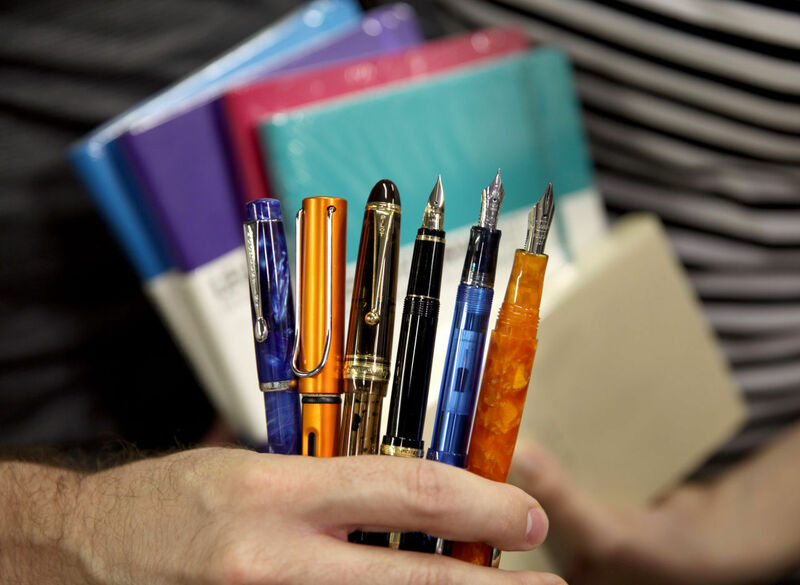 The Goulet Pen Co. grew more than 50 percent in 2014, from the previous year. The company sells a couple of luxury fountain pens that retail as high as $650, but many cost less than $50. Pilot Varsity, its cheapest fountain pen, starts at $3. Other specialty pens are available, as are traditional rollerball pens and pencils. Looking back to 2011, Brian Goulet says major changes took place. The company made its first hire and moved to a commercial office space. The Goulets knew there was no turning back, especially once Rachel quit her job, which had provided the couple with a stable income. Still, they didn’t predict reaching their current level of growth. They now have 30 employees and operate in a 12,000-square-foot space. “Going into a field I knew little about, it was a leap of faith,” Goulet says.